Speaking at the Forum on China-Africa Cooperation, the Communist leader pledges US$ 20 billion in credit. Ostensibly, the aid is to build the local infrastructure and train local workers; in fact, it will enhance China's sway over African natural resources. 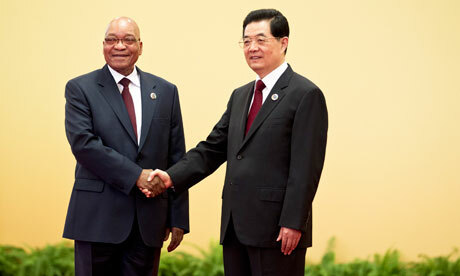 Beijing (AsiaNews/Agencies) - In a push to maintain its privileged place in Africa, China will double its credit up to US$ 20 billion in Africa, said Chinese president Hu Jintao who spoke at a summit in Beijing with African leaders like South African President Jacob Zuma and Benin President Boni Yayi (who chairs the African Union) as well as United Nations Secretary General Ban Ki-moon. The Forum on China-Africa Cooperation is at its fifth edition. Its gives China an opportunity to develop closer ties with Africa, a continent rich in resource but lacking the means to develop them on its own. Hu said that the loans would support infrastructure, agriculture and the development of small businesses. The amount is double what China pledged in a previous three-year period in 2009, when it became Africa's largest trading partner. Trade between the two hit a record high of US$ 166 billion in 2011, up 83 per cent over 2009. "China and Africa's destinies are closely linked, Chinese and African friendship is deeply rooted in the hearts of the people on both sides," the Chinese president said. In addition, China will implement the 'African Talents Program' to train 30,000 Africans in various sectors, offer 18,000 government scholarships, and send 1,500 medical staff. Rhetoric aside, Beijing is well aware that its "yuan diplomacy" is crucial to obtain African oil and natural gas. Without it, it would not be able to keep its current growth levels.